We had an interesting experience, whilst drone training, recently. But first a recap on the rules we teach, both in the classroom & during practical RPA/UAV flying training. Firstly, no one owns the airspace above properties – that comes under the authority of CASA and under CASA rules. Homeowners may think they own the airspace above them but they don’t. The same applies to local councils. They often try to say that you can’t fly drones over their land, parks, beaches etc. In reality, they can only tell you, via a by-law, not to take-off or land on their land; again, they don’t own the airspace. Sometimes it takes a fair bit of explaining to get that point across. Secondly, although the above may be true, it pays not to upset anyone needlessly, or create unneeded publicity; because that may affect your long term company operation. This is why we try to educate people, let people know ahead of time if we need to fly over their property (if we see them) and so on. Recently, we were training at a public oval. 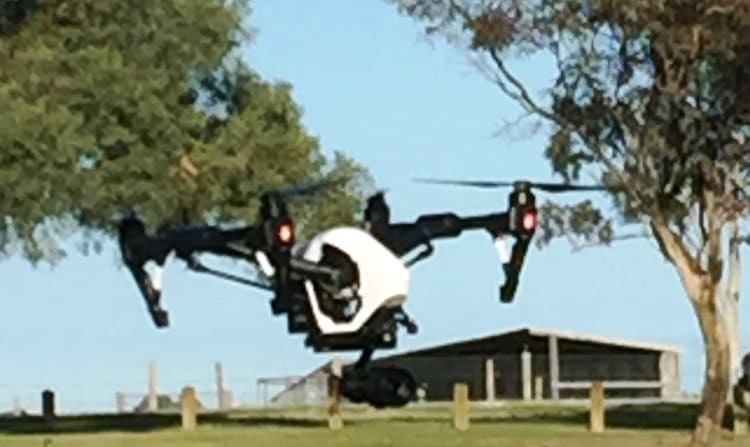 We organised one of our students to fly a Phantom DJI Inspire over an adjacent bush farming area. This involved a crossing of a road, a survey of the area, and practice adjusting the camera and gimbal; all at about 200ft AGL and in full line of sight. A good practice mission, you would think! As the aircraft was returning to land we had a very irate husband and wife come rushing up and proceed to push and hit the Inspire operator (all accidently recorded on the video feed). Fortunately, I was able to separate the guy from the operator. The guy was saying that we upset his horses and how dare we fly over his property! He was also saying things like he was going to get a gun (presumably to shoot down the ‘drone’ [I hope it was only the drone?]). The Inspire video showed no upset horses; and the guy was probably more upset about us flying over his property and what he saw was his airspace. It took some time to explain we were an authorised commercial operation, and that all the flying was legal. He was still upset and stormed off. What to do in such a situation? His actions certainly constituted an ‘assault’; and interfering with a drone pilot in charge of an aircraft probably a Federal police matter. But what would an official complaint achieve? Probably nothing except bad publicity for us and the drone industry in general. In addition, the property owner, upset about his perceived ‘rights’ (although incorrect) would be unlikely to assault anyone again. So we decided to put it down to experience.